Union government on 19 November 2014 relaunched the erstwhile popular small savings instrument Kisan Vikas Patra (KVP) to encourage people to save more and keep them off fraudulent schemes. Here are the things you should know about the scheme. * Kisan Vikas Patra savings scheme was originally launched in 1988. The maturity period of the scheme when launched was five and half years and the money invested doubled on maturity. KVP was a popular saving scheme that doubled the money invested in eight years and seven months. * However, KVP was discontinued by the UPA government in 2011 following the Shyamala Gopinath Committee report. It had suggested that KVPs may be discontinued as they are prone to misuse. * In the newly launched scheme amount invested in Kisan Vikas Patra would get doubled in 100 months or eight years and four months. This means KVPs would be giving a return of 8.7 per cent annually. This is in line with 8.70 per cent per annum interest rate offered by another popular savings instrument public provident fund (PPF). * However, investors would not get any tax benefit for their investment in Kisan Vikas Patra unlike in PPF. * The Kisan Vikas Patra certificates would be available in the denominations of Rs 1,000, 5,000, 10,000 and 50,000 and there is no upper limit on investment in KVPs. 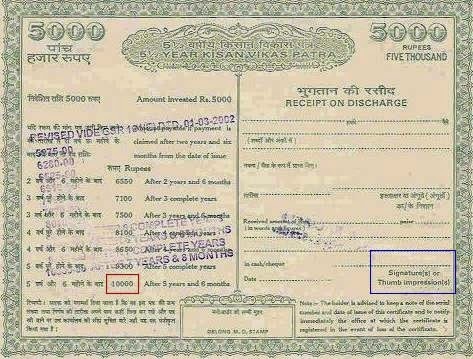 * Kisan Vikas Patra certificates can be encashed after a lock-in period of 30 months or 2 years and 6 months. Thereafter, investors can withdraw in any block of six months. * Kisan Vikas Patra certificates can be issued in single or joint names and can be transferred from one person to any other person/persons, multiple times. * The facility of transfer from one post office to another anywhere in India and of nomination will be available. * Kisan Vikas Patra certificates can also be pledged as security to availloans from the banks. * Initially, the Kisan Vikas Patra certificates will be sold through post offices, but later on they will be made available to the through designated branches of nationalised banks. * Kisan Vikas Patra was very popular among the investors and the percentage share of gross collections secured in KVP was in the range of 9 per cent to 29 per cent against the total collections received under all National Savings Schemes in the country. Gross collections under Kisan Vikas Patra in 2010-11 were Rs. 21631.16 crore which was 9 per cent of the total gross collections during the year. Kisan Vikas Patra scheme was withdrawn in 2011.